Everyone remembers where they were when they found out about the attacks on 9/11. I was sitting in my office when I received an IM from my brother telling me of the first crash and urging me to turn on the TV (I worked for Nickelodeon at the time and had a TV in my office). Turning on the set I saw what I thought was a replay of the crash, but it wasn’t a replay it was the second plane. My entire team crammed into my offices and stared in disbelief as we heard about the attack on the Pentagon, and then each of the twin towers crash to the ground. Just thinking about it brings back memories of fear and confusion. As soon as it was announced the bridges and tunnels were re-opened, I rushed out of my office and began to drive home. My wife begged me not to because of fear of another attack, but like many of those close to the attack, I needed to be with my family. The streets of Manhattan contained only a few cars, we are moving slowly because they were packed with dazed people trying to make their way out of the city. It was a surreal picture, almost like one of those movies where Godzilla attacking Tokyo. The 59th Street Bridge was crowded the same as the streets, dazed people, struggling to get off that tiny island and onto the safety of the Borough of Queens. Gazing out from the bridge to what was soon to be known as ground zero; there was an impenetrable curtain of black over the East River. Even with the car windows closed, breathing was different; the air had a “smoky” taste and a texture like sand paper. I made it home to my family and even drove into the city the next day into work. My memories of the drive home on 9/12 were just as vivid not because of another terrorist incident, but because of something I heard on the radio. Per my usual practice, I spent my drive home listening to NY Sports radio station WFAN. 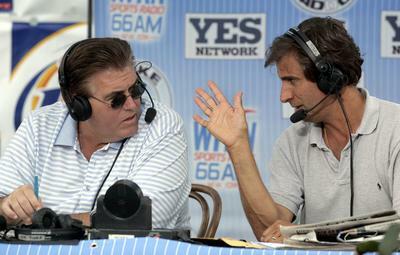 Because I left early, I was able to listen to the PM Drive stars, Mike Francesa and Chris Mad Dog Russo whose biggest entertainment value was they seemed to really hate each other; there was an undercurrent of tension on air. But on 9/12 these two agreed. These two launched a fact deprived commentary blaming both Israel and American Jews for the attack on America the day before. That was not even the worst part, Russo said and Francesca agreed that American Jews needed to prove their loyalty as Americans; choose between Israel, which Mike called “a failed experiment,” and the U.S.” The two bigots thought Jews in America should take a loyalty oath to the country to prove that they were loyal to the US and not Israel. How Did WFAN react to this blatant Antisemitism? One would think that they would have reacted very strongly, after all this is the station that six years later fired Don Imus, who at the time was their number one money-maker, for calling the Rutgers girls basketball team “nappy-headed hos.” Sadly WFAN reacted by sweeping it under the rug while the pair of bigots denied it ever happened ( despite the fact that other listeners including NY Post columnist Phil Mushnick heard the offensive comments). To this day the two (who Don Imus called Fatso and Fruit loops) deny that this incident ever happened. When the NY Post’s Mushnick wrote about the incident in the weeks after 9/11, the sports talkers used some of their radio time to express their denial. Like most Americans who suffered through those horrible days, the sounds, tastes and pictures of the horrible attack on America are embedded in my memory. On 9/12 most Americans, stood united against the hatred of al Qaeda. But here in New York, two sports casters on WFAN chose not to stand united against hatred, they chose to create even more hatred. I am told that they continue to deny what thousands of people heard with their own ears. I couldn’t tell you for sure since I haven’t listened to WFAN since 9/12/01 (where Francesa remains), nor have I tuned to Chris Russo’s year old sports channel on Sirrus/XM.